Glaston is not an official distributor of Atlas Copco products, but our team of professionally trained engineers have extensive experience in the servicing and maintenance of Atlas Copco compressors across the UK. Atlas Copco Compressors are the world leader in air compressor production and supply air compressors in over twenty countries. Although Glaston is not an official distributor of Atlas Copco, we do have access to genuine compressor parts and equipment. Atlas Copco Compressors are made by Atlas Copco, a Swedish industrial group who specialise in the manufacture of air compressors, construction and mining equipment, power tools and assembly systems. The group delivers sustainable solutions for increased customer productivity, through innovative products and services. Atlas Copco compressors can be found in a wide range of applications from printing to pipe pigging, body shops to bottling factories. The extensive product range includes rotary screw, cylinder, tooth, piston, centrifugal and turbo compressors. Atlas Copco compressors are available in both stationary or portable options, oil-injected or oil-free and energy saving variable speed drive. Why choose Glaston's team of qualified engineers? At Glaston, our team of professionally trained engineers have extensive experience in the servicing and maintenance of Atlas Copco compressors. We offer a 24-hour emergency call out service to cover breakdowns and urgent repairs. Our qualified engineers work nationwide throughout the UK to provide a quick, reliable service to ensure your air compressor is running effectively and maintains its performance. 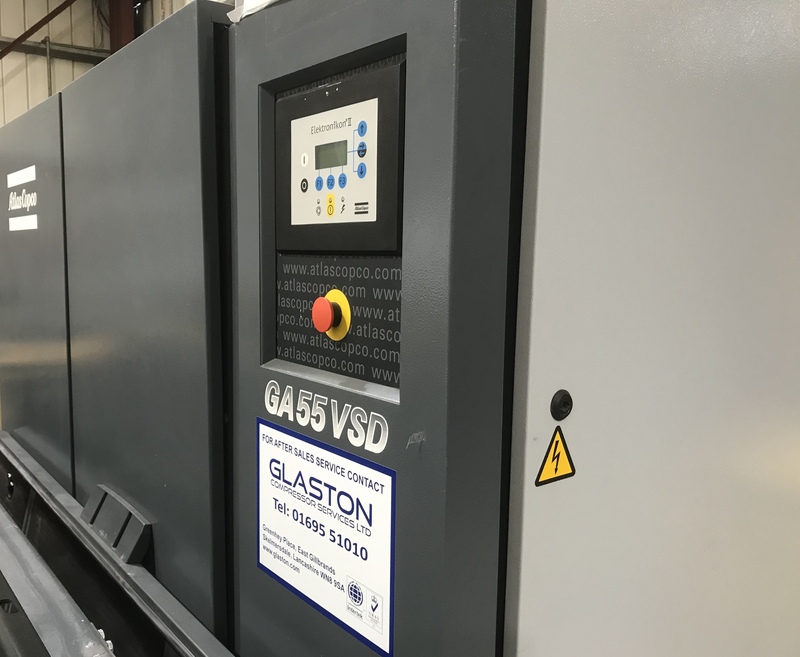 Glaston also supplies and fits other compressor brands such as HPC KAESER Air Compressors, where we are the authorised supplier in the UK. Our team of engineers are experts in the design, installation and maintenance of HPC KAESER Compressors, as well as Atlas Copco Compressors and Plusair rotary screw compressors. We provide single source responsibility contracts to many of our clients whereby we manage, operate and maintain the air compressor systems for the entire facility/factory, thus offering total reliability, service and cost benefits. For more information on Atlas Copco Compressors or for a quote please contact us today. You can also contact us to discuss a range of products and services, including nitrogen generators and vacuum pumps. Our team of engineers have expertise in the design, supply, and maintenance of membrane and PSA nitrogen generators in the UK.